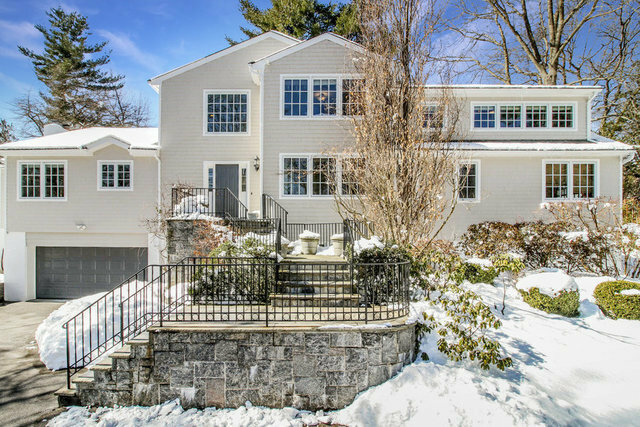 Renovated and spacious Colonial set on a spectacular acre of landscaped property in the highly-acclaimed Edgemont school district, just a 32 minute express train ride to Grand Central and a short walk to elementary school. The first floor features easy one-level living with a double-height entry foyer leading to an open plan, sun-filled formal living/dining room with 10 ft ceilings, picture window views of the stunning grounds and sliders to the patio, a sleek eat-in-kitchen with walk-in pantry and adjacent family room with a 10 ft ceiling, wood-burning fireplace and sliders to the patio, powder room, master bedroom with sliders to yard, ensuite bath and walk-in closet, three spacious bedrooms, hall bath and laundry room. The second level boasts two more large bedrooms, hall bath and attic storage. The lower level is above ground and includes a gym, recreation room, full bath and two car garage. This home is beautifully set on one of the most gorgeous properties in town.